Founded in 1934, Block and Company makes and sells cash-handling products and business supplies that allow banks, stores, casinos, hotels, vending businesses and others to transport, count, deposit and store cash securely and efficiently. The company has been using Magento for several years in its ongoing commitment to providing the most up-to-date avenues for serving its customers. 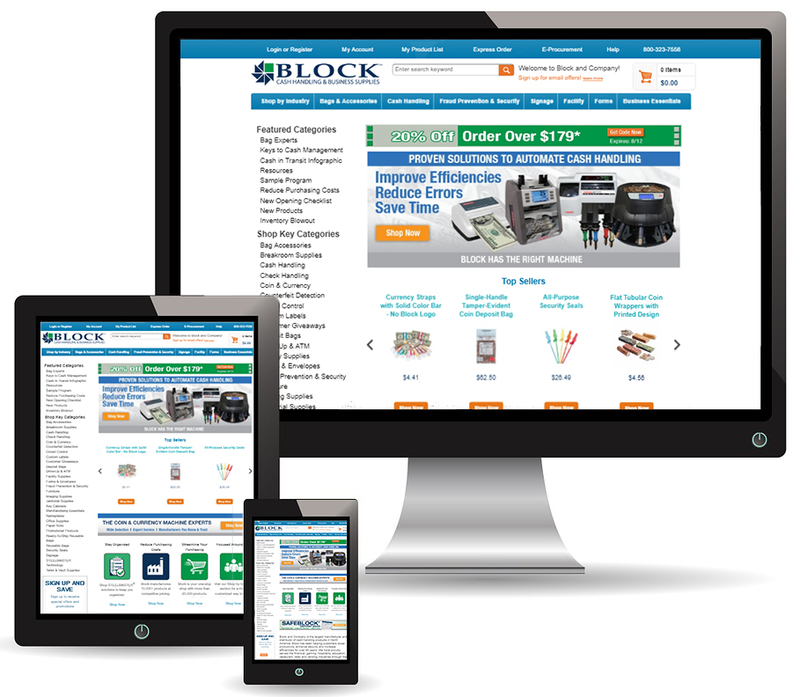 As an expert B2B seller, Block has numerous customer segmentation needs including regional selling rules and pricing and purchase order requirements not commonly found or used on most consumer retail websites. Further, the company needed to tighten and troubleshoot the integration between Magento and their back-office ERP software. Staffed with a lean set of internal resources for eCommerce, Block and Company looked to InteractOne for custom Magento development as well as extension and server environment support. Flexibility is important to the success of the ongoing relationship between InteractOne and Block and Company. Agile development methods allowed us to respond quickly and efficiently to Block and Company’s maintenance needs. Effectively becoming an extension of Block and Company’s internal team, we provide project support, fully controlled repository, development and test environments. Agile development also ensures that resources are available and matched to tasks for maximum effectiveness and efficiency. The ERP integration project, in particular, required a high level of business process and programming knowledge well beyond routine Magento programming. Enhanced shopping experience for Block and Company customers includes segmentation unique to their needs including individual pricing and purchase requirements. In addition, the new site ERP integration provides easy functionality for internal operations. Block and Company can take full control of their eCommerce future with the new powerful features integrated into their Magento site. If you are interested in learning what InteractOne can do for your website or if you would like a quote for a custom site work, please contact us or call us today and speak with an InteractOne representative at 513-469-3345.